Some 24,000 people were evacuated from Brumandinho, Brazil, the town hit by a dangerous mudflow from a dam that burst on Friday, after firefighters feared a second dam might collapse. The remaining dam is no longer at risk and the evacuation has ended. 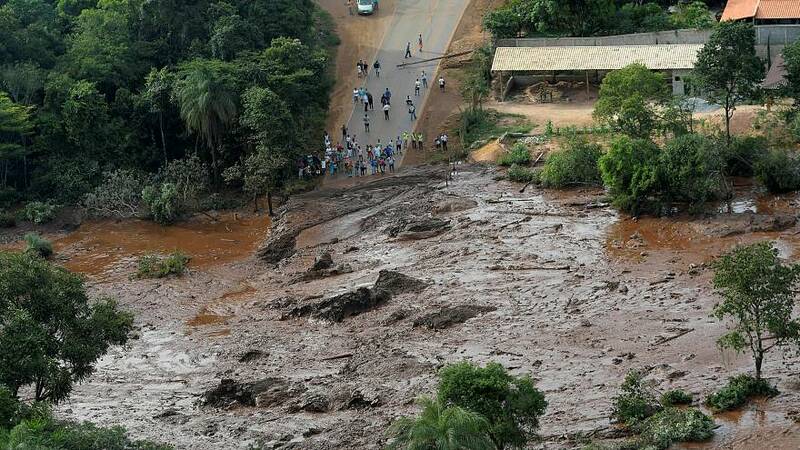 At least 37 people have died in Brazil’s southeastern state of Minas Gerais after a dam burst at an iron ore mine and unleashed a torrent of mud that buried the miners' facilities and nearby homes, officials said. Local Mayor Avimar de Melo Barcelos told TV channel GloboNews that rescuers had found the bodies of people swept away by the burst tailings dam. The death toll was expected to rise, he said. So far, 366 people have been rescued, with 23 people sent to hospitals, said authorities. But the evacuation has diverted attention from a search operation for hundreds of missing people. The government of Minas Gerais said they have imposed a Reais $99 million (€23 million) fine to Vale SA — the company who owned the dam — for "damages caused by the rupture of the dam," said a statement. The money will be allocated for repairs, said the statement, adding that the company has 20 days to appeal the fine. The broken dam released a sea of mining waste that broke into Vale's facilities and reached a nearby community. During a news conference, Romeu Zema, the governor of Minas Gerais, said it was unclear what caused the dam to break. In 2015, Minas Gerais suffered greatly from the collapse of a greater dam, also owned by Vale, that killed 19 people. The Brazilian prosecutor running talks to settle a lawsuit over the 2015 tailings dam rupture at the Samarco mine told Reuters that the deadly dam burst on Friday could scramble those sensitive negotiations. Federal prosecutor Jose Adercio Sampaio said that depending on Vale's culpability in the new disaster, it may change how his task force handles a 155 billion reais ($41 billion) case against Samarco Mineracao SA, a Vale joint venture with BHP Group. That case is currently suspended amid negotiations for a potential settlement.